Since the weather across much of America right now is cold and frightful, I have a suggestion. Make cholent, a kind of Jewish cassoulet or bean stew. Call it what you will, (goodness knows we Jews have a multitude of names and variations for it) but no matter what you call it, it's food that will stick to your ribs and warm you down to your bones. Cholent, virtually a one-bowl meal cooked in a slow oven, over a low flame or, more recently, in a slow cooker or crockpot, was started before sundown on Friday and left to simmer until Saturday lunch, providing a satisfying hot meal without any “cooking” on the Sabbath. The custom dates back centuries. Across the Diaspora, virtually every Jewish community had its own variation of this dish. While the ingredients (and what the dish was called) varied, the concept remained the same. But changes in our lifestyles and religious observances need not make this comforting stew (often of long-simmered beef and beans in a thick, savory sauce) obsolete. Cholent is not just for Sabbath anymore. It makes a great make-ahead dinner, particularly now that the weather has turned colder. There is no one way to make cholent. Below is a slow-cooker version that requires little work and produces a hardy cholent with relatively traditional ingredients and a rich and satisfying gravy. Add a bit less liquid if you prefer a drier stew, a bit more if you would like a soupier dish. This recipe assumes a four-quart capacity slow cooker. If yours is larger or smaller, adjust ingredients proportionally. My first experiences with cholent were ones were made by a college boyfriend’s mother, who was from Poland. I think she cooked them in the oven because I remember they had a deep, almost roasted flavor. She packed her cholent pot full of extra goodies such as kishke (vegetable stuffed intestine) and eggs that cooked in their shells in the cholent and tasted almost caramelized. This version leaves out the kishke, sometimes called stuffed derma, but keeps in the eggs. Using a slow-cooker or crockpot produces a more stew-like cholent with a looser "sauce." Spray or lightly oil inside of a 4-quart or larger slow cooker pot. Turn on to high setting. Add onion, garlic, carrots, beef, potatoes, lentils, beans, salt, pepper, thyme, ginger and paprika. Slowly pour in the chicken stock until it comes up about ¾ of the way to the top of the meat, potatoes and beans mixture. (The slow cooking will release more moisture into the dish). Bury eggs, still in their shell, in the mixture so they are covered. Cover and let cook approximately 8-10 hours until the potatoes are cooked through and the meat is falling apart tender. Taste. Correct seasoning if necessary. If the mixture is too soupy, leave cover off and cook on high for approximately an hour until the sauce has thickened. If the cholent needs to be kept warm after this point, keep covered and turn heat down to low. Serve in bowls with challah or other bread and/or over noodles. A note about the eggs: They will be hard cooked. 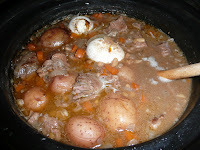 The whites will be tinged a pale brown and have picked up the taste of the stew from the long, slow cooking. Serve them unshelled and let your guests or family peel their own or peel them all before dishing the cholent out.